Interestingly, Jacques and Marie Dardenne Beauchamp were on the same ship, the St. Andre, which left La Rochelle, France, in 1659 as Etienne Truteau (Trudeau). Etienne Trudeau being of course, the ancestor of our current Prime Minister, Justin Trudeau. The information on the two men runs quite parallel. Both were carpenters and both were designated to serve under the Sulpician Fathers in Montreal. Both were assigned to the militia shortly after arrival. Some of the sons of both couples, (Etienne married Adrienne Barbier) became voyageurs and travelled into the U.S., some to settle. They were both born and baptized at St. Marguerite in La Rochelle. So, as in my previous post, People of Purpose, Jacques and Marie set to work helping the beleaguered colony. Jacques was enlisted in the local militia under Maisonueve to patrol what was then Fort Ville-Marie. He was also working on the Supulcian seminary which would be completed in 1663. It is likely that Marie helped at the Hotel Dieu in the early days. In the meantime, they would both be working to clear and farm the land. Below an illustration of the fort in 1645. The population of Ville Marie had fallen to less than 50 in 1651 . Maisoneuve returned to France to retrieve another 100 recruits for the tiny colony and brought them back in 1653. Jacques and Marie were part of the second great recruit in 1659. Iroquois attacks continued until 1663 when Louis XIV made New France a bonafide province of France. Under the great minister of the marine, Jean Baptiste Colbert, troops of the Carignan-Salières were dispatched to New France to bring the Iroquois under control. This was finally achieved one year after my 5th great-grandfather, Jean Beauchamp, brother to Pierre and Jacques arrived in 1666. He was contracted to marry Jeanne Loisel, daughter of Louis Loiselle and Marguerite Charlot. Purportedly, there was a sister, Marie born in La Rochelle in 1638 who had died in Montreal in 1652. She may have died at the hands of the Iroqouis.That would mean that all of the siblings would have been in Canada by 1666. Sadly, there is very little about Pierre, the oldest brother and Marie. Jacques was 9 years older than Jean and probably paved the way for him in many things. His marriage to Jeanne Loiselle would also have helped him settle in. Jacques and Jean were “engages” who were contracted to help clear land or build on it for three to five years after which time they would be given the opportuntiy to pay a fee and stay on. The land system in Quebec was slightly different than the old feudal system in France in that the seigneurs had obligations as well as the censitaires or “habitants”. The title to all land belonged to the King who granted estates as he saw fit. The soil belonged to the seigneur but the minerals and oak trees belonged to the King. Seigneurs who did not improve their land lost it to other more enterprising men. Initially, the Compagne des Cents Associes were granted legal and seigneurial rights over all of New France. They in turn, set up 50 seigneuries along the waterfront stretching between Quebec and Montreal. In turn the seigneurs agreed to bring out settlers to farm the land and pay them rent and dues. The Intendant, a government representative, oversaw the seigneuial system. Jean Talon, the first Intendant made occupancy a requirement and kept the size of the seigneuries small to prevent the rise of a large landowning class. 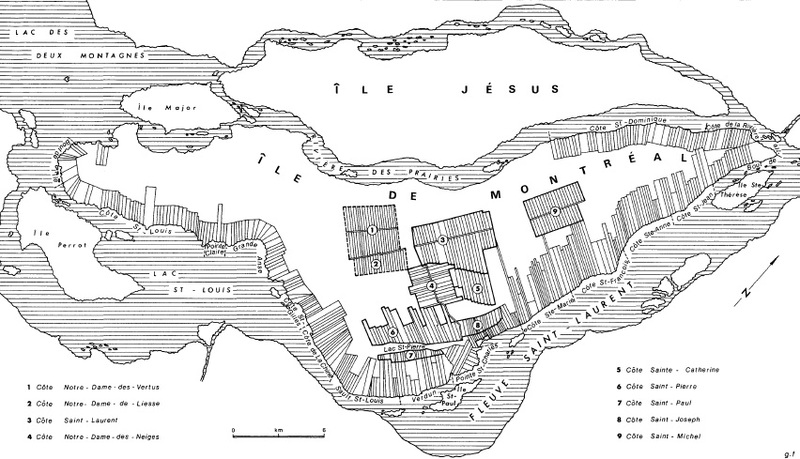 By 1715, there were 200 seigneuries lining the St. Lawrence River. Below you can see how the siegneuries were laid out, running perpindicular to the St. Lawrence river in long strips, except for in the interior of the island. The “côtes” or ranges still ran north and south. This entry was posted in Jacques Beauchamp, Jean Beauchamp, New France and tagged engages, History of Quebec, Jacques Beauchamp, Jean Beauchamp, Montreal, New France, Settling Montreal by Shamwest. Bookmark the permalink.